The molecular regulation of pluripotency has been most intensively studied in early mammalian development, but whether the transcriptional networks revealed in mouse and man also regulate pluripotency in other deuterostomes has remained unclear. A paper in this issue of Development now addresses the evolution of pluripotency with an analysis of the function of PRDM14 in zebrafish, amphioxus and sea urchin. We caught up with first authors Masanori Kawaguchi and Kota Sugiyama and their supervisor Yoshiyuki Seki, Associate Professor at Kwansei Gakuin University in Sanda, Japan, to find out more about the story. Yoshiyuki, can you give us your scientific biography and the questions your lab is trying to answer? YS From undergraduate to Master’s student, I trained as a cell biologist, supervised by Professor Hirofumi Kai at Kumamoto University. During this period, the Kai laboratory journal club started at 7:30 am every day, so I read a lot of papers, including a lot about developmental biology, and I decided to move to the developmental biology field for my PhD. As a PhD student, I began to investigate epigenetic reprogramming in primordial germ cells at Osaka University. I then did postdoctoral research at Mitinori Saitou’s laboratory at RIKEN, and identified that Prdm14 is specifically expressed in germline cells. Then in 2009, I got my independent position at Kwansei Gakuin University and, since then, have deeply analysed the function of PRDM14 in epigenetic reprogramming in pluripotent cells. Considering the expression pattern and functions of Prmd14 in mice, the gene looks like the master regulator for germ cell specification. But even in humans, the expression pattern and functions are entirely different. A recent major aim of our lab is to uncover the origin and co-option of pluripotency networks during deuterostome evolution. 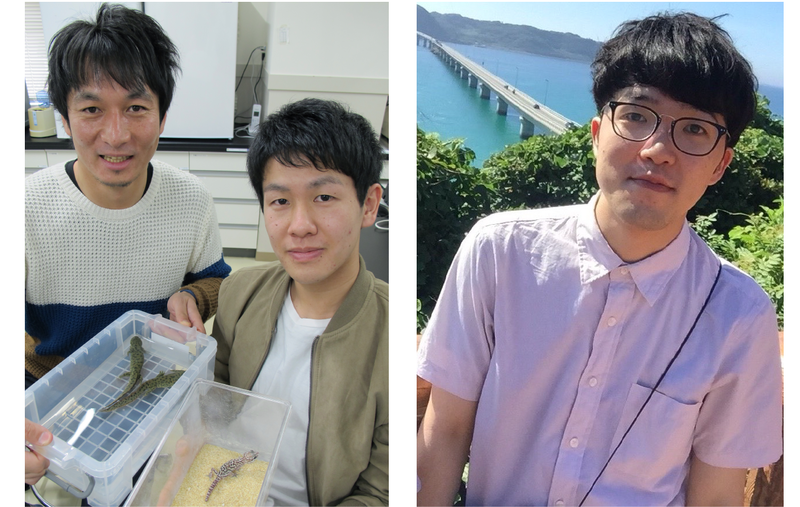 Masanori and Kota: how did you come to join the Seki lab, and what drives your research? MK When I was an undergraduate, I was fascinated by the Seki lab’s research, and it was exciting to see Dr Seki performing experiments! KS When I was an undergraduate student, I was interested in research about pluripotent stem cells and also fascinated by the evolutionary history of pluripotency networks, both questions that the Seki lab works on. My driving force for research is curiosity to uncover unknown mechanisms. What was known about the evolutionary history of the mammalian pluripotency network before your study? MK, KS & YS The mammalian pluripotency network has been deeply analysed using mouse embryonic stem cells. This network is regulated by the core transcriptional regulatory circuitry that is centred on POU5F1 (OCT4) and NANOG. However, the pluripotency network in non-mammalian deuterostomes has remained largely unknown. Recent studies of the genomes of several deuterostome species have suggested that Pou5f1 and Nanog might appear on the genome at around the emergence of cartilaginous fishes. Because Pou5f1 and Nanog are expressed in pluripotent cells in the axolotl embryo, these factors have already been integrated into the pluripotency network at around the emergence of urodeles during vertebrate evolution. MK, KS & YS Our paper shows that Prdm14 is specifically expressed in motor neurons of the amphioxus embryo, similar to the pattern that is observed in the zebrafish embryo. 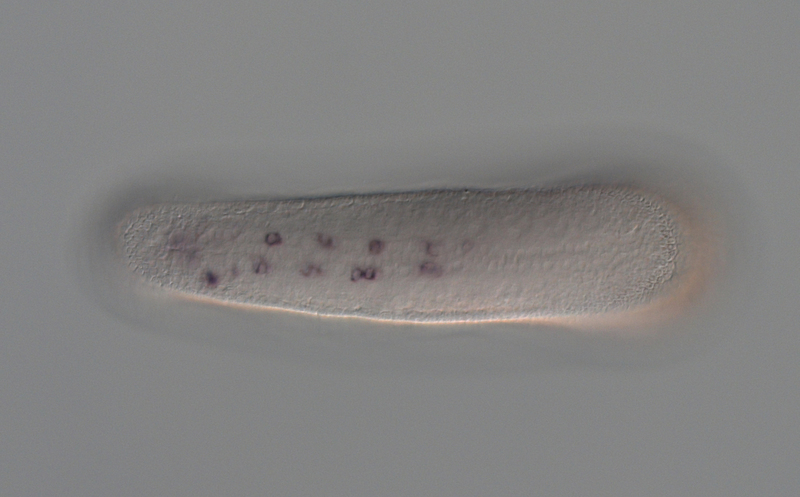 Before getting this result, we thought that the expression pattern of Prdm14 in the zebrafish embryo might be a specific phenomenon, because the synteny of Prdm14 is specifically not conserved in the zebrafish genome. Conservation of Prdm14 expression in motor neurons among non-tetrapod vertebrates led us to a novel concept: the co-option of PRDM14 from motor neurons into pluripotent cells might be crucial for the stabilization of the undifferentiated state in pluripotent cells in the early embryo of amniotes. Why do you think amniotes needed a new transcriptional circuitry to regulate pluripotency? MK, KS & YS A major difference in early embryogenesis between non-amniotes and amniotes is the complexity of the extra-embryonic tissues. In amniotes, the undifferentiated state of pluripotent cells needs to be maintained before the maturation of extra-embryonic tissues, especially in mammals. We speculate that the stabilization of the pluripotency network – by integrating the PRDM14-CBFA2T complex in pluripotent cells – might provide the evolutionary competence for creating de novo extra-embryonic tissues during amniote evolution. Prdm14 expression in amphioxus motor neurons. What do your experiments using sea urchin PRDM14-CBFA2T suggest about the deeper evolutionary function of the complex? MK, KS & YS The function of the PRDM14-CBFA2T axis has not yet been analysed in the early embryo of echinoderms such as sea urchins. Previous studies have shown that sea star PRDM14 is expressed in the embryonic gut, a multipotent tissue that has the capacity to create primordial germ cells. Our compensation assay using sea urchin PRDM14 and CBFA2T completely rescues the defect of self-renewal in mouse embryonic stem cells lacking mouse PRDM14 and CBFA2T2. This suggests that the PRDM14-CBFA2T complex might be involved in the maintenance of multipotency in the sea star. MK My most exciting moment was when I performed immunoprecipitation to elucidate the relationship between the PRDM14-CBFA2T interaction and the maintenance of self-renewal of mouse Prdm14 knockout (KO) embryonic stem cells. KS I was really excited when the combined expression of sea urchin PRDM14 and CBFA2T rescued the self-renewal defect in mouse Prdm14 KO embryonic stem cells. We expected that the binding capacity of PRDM14 orthologues with CBFA2T would have been acquired during the evolutionary route to chordates after the splitting from the common ancestor with echinoderms. KS I used several cell lines to detect the interaction of PRDM14 orthologues and mouse CBFA2T2 using immunoprecipitation. To obtain the clear band in all conditions, I had to perform immunoprecipitation-western blotting repeatedly, which was quite frustrating! So what next for you two after this paper? MK Since finishing my Master’s course in 2017, I have been working at a food company as a researcher. KS I recently identified new molecules regulating the transition from pluripotent stem cells into the so-called two cell-like cells. In the future I would like to investigate the evolutionary conservation and diversity of the zygotic genome activation pathway, using mouse and newt. Where will this work take the Seki lab? YS Comparing the expression pattern and function of PRDM14 offers a framework for addressing how pluripotency transcriptional networks evolve in deuterostomes. We are interested in when and how PRDM14 integrated into pluripotency networks from motor neurons. We consider urodeles and reptiles to be key organisms for determining the integration timing of the PRDM14-CBFA2T complex in pluripotent cells. We are also trying to identify the cis-regulatory elements that are required for PRDM14 expression in pluripotent cells in mice and human. Interestingly, the expression pattern of PRDM14 is quite different between mice and human, and the mouse epiblast displays a unique epiblast morphology (referred to as an egg cylinder) whereas the human epiblast forms a disc. We expect that the identification of a rodent-specific cis-regulatory region of PRDM14 might contribute to our understanding of morphological differences in the epiblast of rodent and non-rodent mammals. Finally, let’s move outside the lab – what do you like to do in your spare time in Sanda? YS Sanda city has a lot of beautiful nature and parks. When my two children were pre-school, I often took them to these parks and also went hiking with my wife. Recently we’ve been taking my son to football and basketball club, and we play together every weekend.